It’s that time of year to roll out the barbecues and start cooking up some summer favorites with friends and family. So what better time to host a biker-style barbecue than this weekend? Wings: One of my all-time favorite chefs is Guy Fieri of The Food Network. I like his style and I love his recipes! In fact, one of my favorite recipes from Guy is his Carolina Wings recipe, which combines spicy, tangy, and sweet. You’ll want to make a lot of these since they’ll go fast. Sliders: For some tasty sliders, I suggest Emeril Lagasse’s recipe for Sirloin Sliders with Crispy Bacon and Creamy Horseradish Mayo. You’ve never tasted anything so good and neither have your guests. 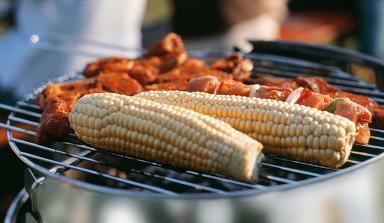 Corn on the Cob: Chef Bobby Flay can teach you a thing or two about awesome barbecue. In my opinion, one of his best recipes is his Grilled Corn on the Cob with Barbeque Butter. It is truly the best compliment to any barbecue. Potato Salad: With ingredients that include fresh lime juice, ancho chilies, beefsteak tomato, garlic, and jalapenos, Bobby Flay’s Mesa Grill Potato Salad is an absolute must for a biker barbecue. It’s creamy and fresh and will knock your socks off with zing and spice. Sandwiches: When it comes to real southern barbecue, just look to The Neely’s of The Food Network for their expert tips. With their recipe for Pulled Pork Sandwiches, you’ll never be able to find another sandwich quite like it. Spice up your barbecue even more with some biker-style decorations. Some items might include . . .
A Skull and crossbones tablecloth and plates.